With much regret, I have to say that with all of the excitement, work, and fun going on during the Italian festival, I got really distracted and forgot to take pictures of the most important part…the food! Friday was a pretty hectic day, considering it took me forever to try to get out of Chicago. The Hawks had just won the Stanley Cup and the city was going crazy. There were millions of people outside my office building all day and all the streets around me were closed off. I made it to the bus stop with about 3 minutes to spare – only to encounter problems with a bus driver who did not want to let me on the bus! Good thing I know how to get my way…he finally let me on so I could make it home in time for the festival! 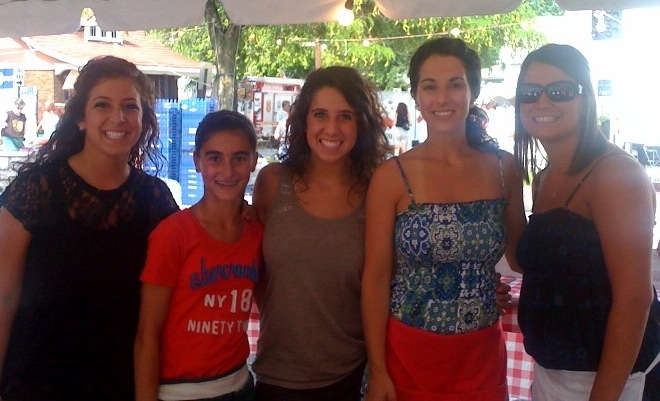 A few of my cousins and my sister during the festival! I know I can’t share with you what the food at the festival looked like, but I can tell you all about what I ate and everything the festival had to offer. Friday night, I must admit, I was too busy enjoying many Peronis to eat anything, but I did try a bite of a breadstick (amazing as always) and some fettuccine. I try the fettuccine every year (I’ve never not tried it for as long as I can remember), and it is always, without fail, satisfying. I was very proud of myself though for not tasting any of the desserts (when you are looking at them all night, it’s hard to resist the urge to take a few bites of heavenly chocolate or my all time favorite, cheesecake). Saturday night was a different story. I gave in to all of my urges and just went for it. I had tortellini in a red sauce, tried some vegetable lasagna, fried ravioli, pizza, breadsticks, and a new addition to the food line up, not sure what they are called, but they were fried balls stuffed with mushrooms, spinach and artichokes. They were ok – but my favorite of the entire night was the vegetable lasagna and for dessert a Cannoli (if you have never had one of these before, I suggest you find one at an Italian bakery and indulge!!). Before you start judging me and the amount of food I consumed, realize that I only took a few bites of all of these things. 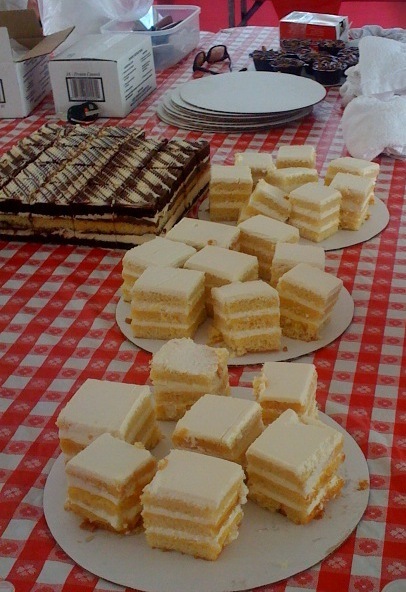 With my large family holed up in a tent all night, there is a plethora of food around! I only ate a small bowl of the tortellini on my own – that I was not willing to share! 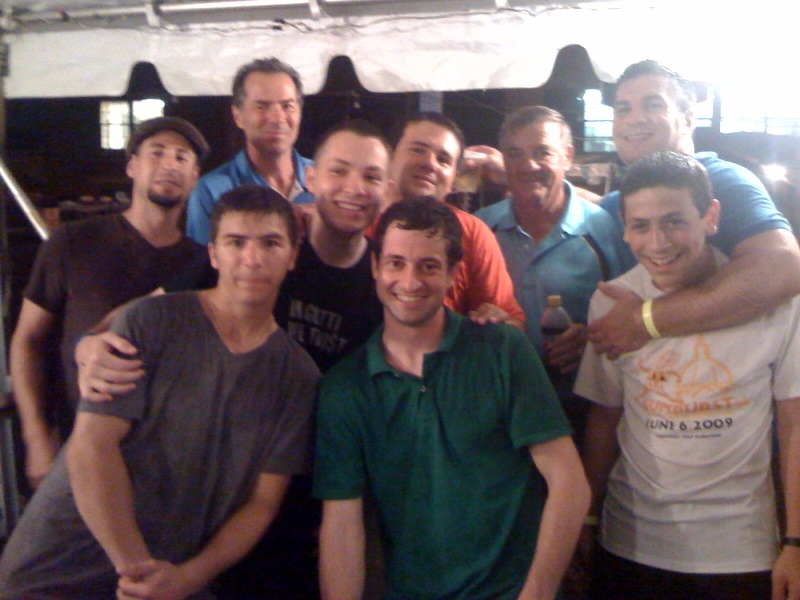 My Dad, Grandpa, Brother and Cousins – All enjoying the storm under the tent! Overall, the festival was a great time. The rain did try to put a damper on the weekend, but Italians never let anyone or anything rain on their parade! Saturday night, when the rain started to come down around 9:00PM, most of the people left or headed for shelter inside the church. The parking lot was almost empty, except for one tent. The Pastry stand. As I headed down the street to help cleanup, I saw my Grandfather, standing inside the tent, surrounded by a mass of people, selling as many pastries as he could. Now that is dedication. It was thundering and lightening outside, but my Grandpa wasn’t going to stop until he did everything he could to make money for the Church. There are very few people in this world who have as much heart, dedication, and a sense of hard work as my Grandpa. He is a true role model, a wonderful man, Grandfather, Dad, and an even better Italian. Although we didn’t make as much money as last year, due to the weather, the Festival was, as usual, a great time and made a lot of money for the Church. Me and my Grandpa – serving Cannoli’s at 11PM in the rain! Rain or shine, the Italian Street Festival will always be one of my favorite weekends of the year. It is so much more than a festival, to me and to many other people who volunteer away their weekend, who get to spend quality time with loved ones, and who are able to make great friends. Sometimes we can view it as a burden, but when it is all said and done, and you look back on the weekend, it has to put a little smile on your face. I apologize for the lack of food, but this is a major part of my Big Fat Italian Life, so I hope you enjoyed a glimpse of life as an Italian! Thanks Zia! I actually saw that one too and used a few ingredients to make my version!